It’s Just a Tree, Right? 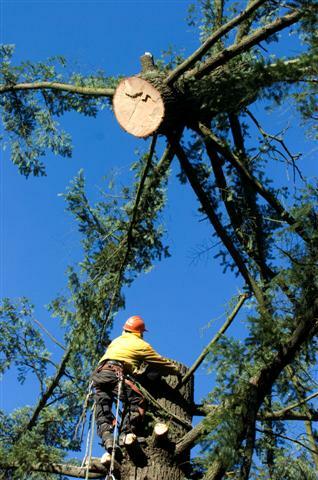 Now, a tree that could provide shade and protection is cut down for the sake of the Arbor School. How could I possibly expand on this? Now please don’t get me wrong, my family built its meager fortune (very meager) by cutting down thousands of trees in Western Oregon. I have too many deaf, retired lumberjacks in my own family tree to give me any room to dispute this. On the other hand, I see people rapidly using up what once used to be considered renewable resources. So, without trying to offend others, I see it as a personal responsibility to seek better stewardship of our resources (read: trees). Because of this, I hate to see any tree cut unnecessarily. It seems to me that if the folks at Arbor were serious about their name, they’d have found a way to avoid cutting down this 110 year old ancestor. What do you think? Am I whacked? I’ve cut out 3 very large trees on my property because they should never have been planted there in the first place. 2 giant sequoias were uprooting an older walkway (major) and 1 western redwood was uprooting the house (which was also older than the tree). Sometimes people don’t think when they plant things and then 40 years down the road someone else gets to pay the $3800 to deal with the problem and replant with appropriate trees. No, you’re not whacked. Born and raised in Oregon, I have an appreciation for the environment. On the one hand I don’t believe the spotted owl is truly endangered. On the other hand, I think that renewable resources must be carefully guarded, especially such an ancient “ancestor” tree that could be used as a symbol for the school. I just don’t understand some building architects, contractors, and landowners, I guess. Good thought, Gary. How are you liking Oregon?